As I’ve said, Cities Skylines has its flaws as a city management game, but as a toy to build stuff with, it’s in a league of its own. As we see here, with inthoughtwelive’s near-perfect recreation of Seattle. 12 Months Later, How&apos;s Cities: Skylines Going? 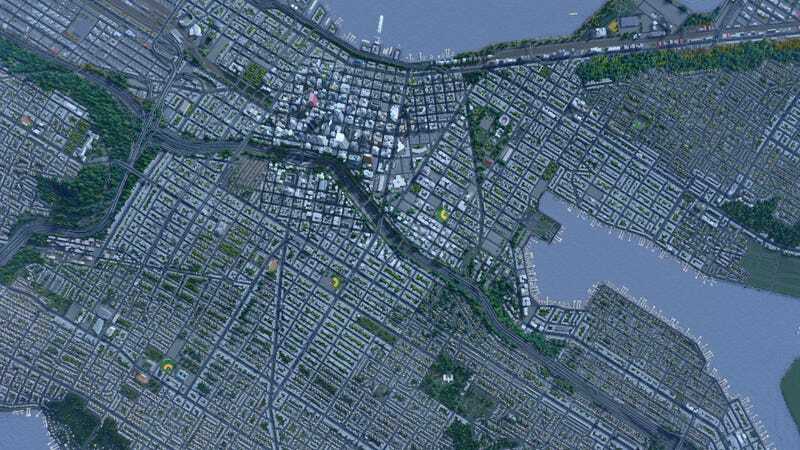 It’s not perfect perfect, because Skylines has a stupid limit on the number of buildings you can drop on a map (so outer suburbs are missing or unfinished here), but for the heart of the city itself it’s still incredible work. Between mods and meticulous placement, you can make out everything from major landmarks (Space Needle, Mariners & Seahawks stadiums) to residential backstreets. Only catch, other than the building limit, is that in keeping with another of Skylines’ quirks, the population count for all that urban space is weirdly low, with “only” 170,000 people calling it home (the actual Seattle has over 600,000). Though to balance things out on the realism scales, seems traffic here barely works at all without mods, which sounds just like the real thing.